A former Maytag facility that was used to test washing machines in Newton is now the site of a brewery. 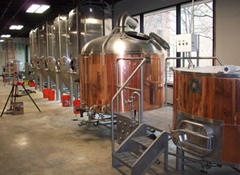 Mason Groben started The Madhouse Brewing Company, moving copper kettle and stainless steel fermentation tanks into the former Maytag testing room. The Iowa-grown hops for Groben’s brews are still a couple years away, but Madhouse plans to roll out its pale ale and an American style wheat beer to grocery stores and bars soon after the new year. Groben named the pale ale “Pastime,” an homage to Maytag’s original wooden washing machine. Newton Mayor Chaz Allen and others lobbied state lawmakers this year to change a prohibition-era law that prevented Groben from working for both a winery and a brewery. Twenty investors are hoping Groben’s business is a success, too.